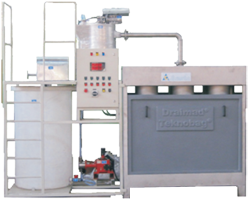 The sludge dewatering system uses disposable/reusable bags, in accordance with the TEKNOFANGHI patent. The special filtration bag made from water repellent material is mounted on stainless steel frame designed to give even sludge distribution. This system is modular and optimises the dewatering cycle. Low Operation and Maintenance costs. No direct contact with the sludge – good in terms of EHS. No spillage of sludge – Clean surrounding. Low foundation / installation cost. 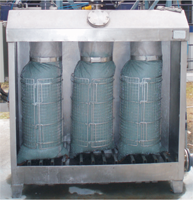 Capable of handling sludge up to 20m3/day. Copyright © 2019 Auric Techno Services Pvt. Ltd.